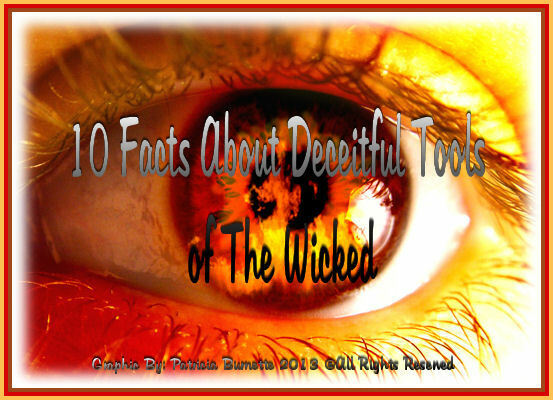 Welcome to "10 Facts About Deceitful Tools of The Wicked"
The Deceitful will use all sorts of Tools to deceive someone, they will use all manners of deceit they have to get their way or to fool you. I have listed those below! Deceit- Means the action or practice of deceiving someone by concealing or misrepresenting the truth. Such as the following acts of the deceitful and the wicked are; "a web of deceit" deception, deceitfulness, duplicity, double-dealing, fraud, cheating, trickery, chicanery, deviousness, slyness, wiliness, guile, bluff, lying, pretense, treachery.